Criminal madman Cody Jarrett, long dominated by his mother, breaks out of prison and plans a heist with his former gang assoiates. Jimmy Cagney's finest performance. Received an Oscar nomination for Best Story, and an Edgar nomination for Best Motion Picture. Entered 2003 into the National Film Registry. 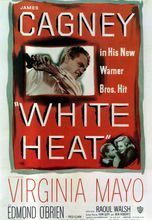 James Cagney at his BEST! What else is there to say? All in all a very good film. Thanks for reading me.